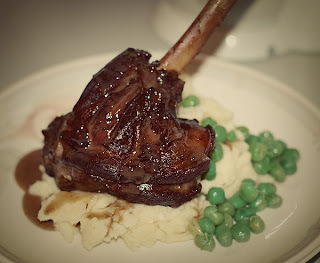 As last week was dessert, I decided to make my new recipe for this week a main course ... braised lamb shanks in a red wine sauce to be precise. I've never had lamb shanks before, but whenever I've seen them on the menu in a restaurant, I've always been tempted. 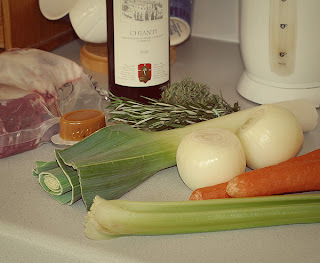 I searched the Internet and eventually picked this recipe from Anthony Worrall Thompson. Relatively simple and it didn't require lots of new ingredients that wouldn't then get used again or any special equipment. I had all the bits 'n' pieces needed. The key to making this recipe a success, would be time ... and plenty of it! Lamb, leek, onions, carrots, celery, garlic, chicken stock (condensed pot), red wine, thyme, rosemary and bay leaves ... all good, right? I had a bit of a challenge trying to fit 3 lamb shanks (1 for me, 1 for DH and 1 for my brother) into my casserole dish, so I had to improvise and put one of them into a little roasting tin (which then meant I then had to rotate the meat every 30 minutes or so, so that it braised rather than roasted). The meat was wonderfully tenders and literally fell off the bone! I "ummmed" & "ahhhed" about whether or not to include the cooking vegetables in the final dish. I opted to remove them, but I strained all their goodness through a sieve and into the sauce, which really intensified the richness and flavour. Delicious! I'll be honest and say it's not a recipe I'll be cooking regularly (mainly because of the time factor! ), but I enjoyed it non-the-less and it's another recipe I can tick off my list! Sue! This looks like a five star dish in a fancy restaurant! I'm so impressed with your cooking skills. We've never cooked lamb before, ever. Love the plating too, such a nice looking meal! I'm salivating, ha ha!